Greg Sandoval/Business InsiderGoogle CEO Sundar Pichai at the 2018 Google I/O developer conference. 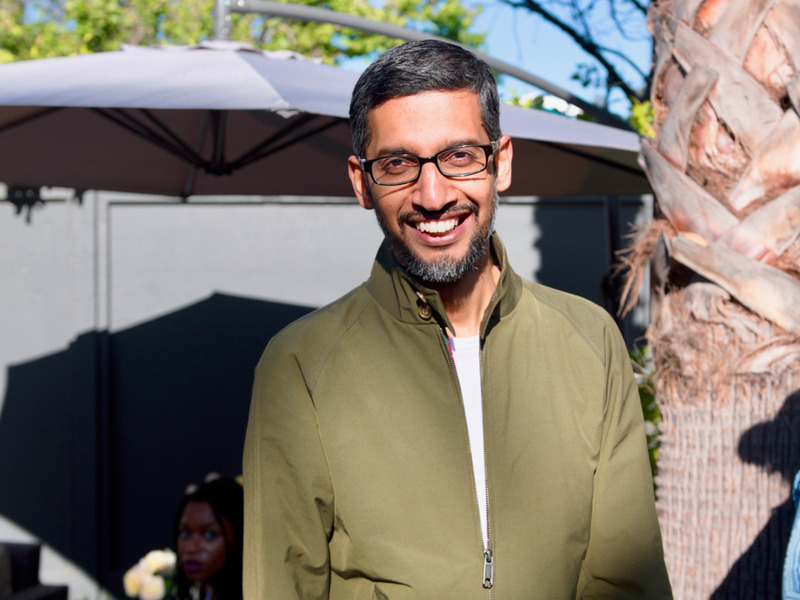 At a tech gathering in San Francisco on Monday, Google CEO Sundar Pichai remarked on an internal protest that rattled the company earlier this year. The protest stemmed from opposition over the company’s work on a military project. Pichai downplayed the influence those demonstrations had on management decisions. Thousands of Google employees participated in an internal protest against the company’s participation in a high-tech military project earlier this year, but the unprecedented revolt at the company had little influence on management’s decision-making, according to CEO Sundar Pichai. At a gathering to celebrate Wired magazine’s 25th anniversary, Pichai was asked whether Google’s employees had anything to do with the company’s announcement last week that it will not compete for a much sought-after $US10 billion cloud-computing contract offered by the Pentagon. In March, when word leaked that Google had quietly contributed to Project Maven, a Pentagon effort to use artificial intelligence to analyse drone video footage, more than 4,000 Google employees signed a petition demanding the company stop the work. Some employees leaked documents to journalists and about a dozen resigned. In June, Google’s leadership appeared to respond to the protest by releasing a set of AI principles designed to govern the company’s ethical use of the technology. They included a promise never to build AI weapons. Back then, it sure seemed like the opposition within Google to Project Maven had forced the company’s hand. But on stage at Wired25, Pichai said that Google plans to work with the US Department of Defence in the future, perhaps in such areas as cyber-security or transportation planning. He said Google very much supports the US armed forces. “We deeply respect what they do to protect our country,” he said. He made it clear, however, Google will not work on autonomous weaponry or anything that violates the company’s AI principles. Pichai was also asked about Google’s possible plan to once again offer a search engine in China. This summer, The Intercept broke the news that Google had built a search engine that would censor information. Google search pulled out of China in 2010, claiming it could no longer comply with the government’s demands that the company filter information. To return to China, Google would again have to filter information that authorities find objectionable. Some groups argue that censoring information is a violation of human rights. Pichai said the offering search in China, home to 20-per cent of the world’s population, is important to the company. As for a censored search engine, Pichai said the company wanted to see what a Google search engine that complied with Chinese law would look like. He gave no timetable for a return to China.